I recently had the chance to fly business class quite a few times with TAP Portugal, both short haul and long haul. In addition to the very special Lisbon to Toronto A330 retro jet flight, I also completed flights between Barcelona and Lisbon and back and a return trip between Lisbon and Funchal (Madeira) too. All short haul sectors were flown on a combination of Airbus A320s and A319s, with the cabin layout and service being pretty much the same across both types. So, unlike in other occasions, this flight review does not refer to one specific flight but combines elements of all these journeys. I also had the chance to experience TAP's business class lounge at Lisbon airport, right on the day it was inaugurated after a major overhaul. As we have mentioned on other occasions here, TAP Portugal is going through a process of investment to upgrade and streamline many of its operations and become a major player in the transatlantic market. This goes hand in hand with the emergence of Portugal itself as one of the most fashionable tourist destinations in Europe right now. This was, thus, a great opportunity to see and experience first hand the "new" TAP. First of all a word about TAP's mobile app. As the flight was courtesy of the airline, I did not have to complete the booking by myself, but I did use the app to check in and get my itinerary details quite a few times. It was all pretty smooth, very straightforward. I got reminder emails from TAP the moment the flight was open for check-in and an email link brought me straight to the app (I had downloaded it first). Just a few clicks and done. The user interface was also quite good (including some very alluring images of Lisbon and Portugal). It also correctly prevented me from checking in when it detected that I had forgotten to add the Canadian immigration form details. At Lisbon airport I had no problem whatsoever in using the electronic boarding pass on my mobile. The only glitch of the trip was at the very beginning, as the flight was overbooked and a fellow passenger and myself (third overbook of the year in as many airlines so far!) had to wait a few minutes until the situation was sorted. To the credit of TAP ground staff at Barcelona airport, we could finally board the flight. If you fly business class on TAP from Barcelona airport you have access to the Pau Casals lounge, that is located on an upper floor of Terminal 1, shortly after passing the security controls (you have first to go down to the main floor and then up again through an escalaor or lift). This is a lounge shared by quite a few airlines (among them Star Alliance ones). I spent a very short time there, but adding a few pictures so that you get the idea. The aircraft flying us to Lisbon, an Airbus A320. It has a two class cabin, although there is very little in the way of separation between business and economy, just a frame that can be used to place a curtain, but that was not used at all. Seats seem to be the same for both classes. The difference is, thus, mainly in the "software" part of the experience: priority boarding, lounge access and in-flight meals, rather than a differentiated onboard product (this is not the case in long-haul, where both classes are much more differentiated, but this is a story for an upcoming post). In any case, the flight from Barcelona to Lisbon is just 1.5h, so it really does not make much of a difference. On the inflight magazine, the 1970s TAP retro jet initiative that I was to experience soon after with the flight to Toronto. A nice way to celebrate the history of such an historical airline right when it embarking on quite a transformative forward-looking project. Seats are also quite good, reclinable and with a leather cover. It is remarkable that all TAP aircraft I flew, A319, A320, A330 gave an impression of new and modern. Very neat. An increasingly important feature: USB port and electricity plug to charge your mobile device in-flight! I became a frequent visitor to the airport over the next few days, not only upon arrival to Lisbon from Barcelona but also on return flights to and from Funchal (Madeira) and Toronto. What follows is a recollection of my experience using TAP's lounge at Lisbon airport, which just happened to open on the day I first used it. So, I can say I saw TAP's lounge pretty much in "mint condition"! The lounge is rather contemporary in its design, all in shades of soft cream and green colours. It also has direct panoramic views to the runway and apron, which is a big plus for aviation enthusiasts like me. The bar has a broad selection of wines from all the different Portuguese wine regions. One of the highlights at TAP lounge is food. Absolutely glorious and, on this account, one of the absolute best I have seen of late anywhere in the World...but maybe is because I really love the little Portuguese cream cakes ("pasteis de nata") and pear juice? The food selection is broad though, so even if you don't have sweet teeth you are likely to find something of your taste. Tip: the shrimp and mushroom cakes and the mature Portuguese cheese were also amazing! Here's another feature of the lounge that really caught my eye. This machine de-wrinkles any suit in a matter of minutes. You just have to hang the suit in here, select a time and you can head to the next business meeting as if your suit was just out from the dry-cleaners. In the following video, a member of TAP's staff makes a practical demo of how to use the suit de-wrinkler machine. There are also showers at TAP's lounge - convenient for those passengers coming out of long transatlantic flights. Here is how they look like. Towels and tolietries complimentary, of course. And up in the air again. Here on the flight to Funchal, in the island of Madeira, on an A319. Note that the cabin interior is pretty much indistinguishable from that of the A320 that flew us from Barcelona. Same seats, same layout. One of the bonuses of flying TAP is the magnificent views of Lisbon that you get when flying in and out of Humberto Delgado airport. This is the reason I nominated Lisbon as one of the most scenic aiport approaches in the World when I was asked my opinion for PrivateFly's annual most scenic airport approach competition. It's just a 1.5h-flight to Funchal, but enough time to get into the sub-tropical island mood with a rather fruity light meal. Approaching Madeira. The island has such as rugged orography that there is barely enough flat land to build a runway. 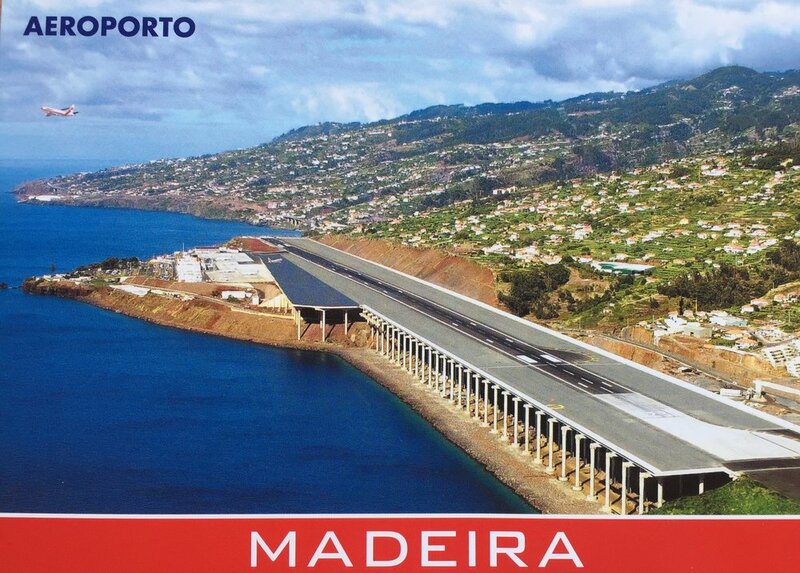 Well, in fact there was NOT enough flat space to build a runway, so Madeira's airport runway had to be built aircraft-carrier-like on top of a man-made structure the side of a hill. Note in the postcard below how the runway is partly sustained by pillars. This is as flat as it gets in Madeira! Funchal airport is named, since 2015, after local football star Cristiano Ronaldo, a native of the island. (he has also a hotel in the center of Funchal). Besides the links to mainland Portugal, Funchal gets plenty of flights to destinations in Northern Europe, operated by Easyjet, Transavia and other leisure market-oriented operators. It has also links to the nearby Canary Islands and the Azores. Below you can see how close you are to the water at Funchal airport, while taxiing. The TAP A320 that flew us back to Lisbon had a slightly different cabin interior. Instead of the more modern slim, black leather seats, it had these slightly older-lookin¡g, more bulky seats. I did not appreciate much diference when it comes to seat pitch or service, though. A light meal. Citrus fruit and some cold cuts of meat. I did not take any pics but I can not fail to mention that TAP coffee is excellent! Finally, the last leg of this Portugal journey. Again an A320 with the modern TAP narrow body cabin. Again no noticeable differences with the previous flights. A note of praise here for TAP's food (again!). Yes, it looks like this is one of the areas where TAP's investment is really, and visibly, paying off. Every single item in this business class meal was excellent. And the portions (judge by yourself) very generous! See you soon (hopefully! ), Lisbon! TAP is making a great effort to become a force to be reckoned with in European aviation and this is really showing in the passenger experience. Granted, the difference between business and economy cabin is, apparently, not that large, but this says a lot more about the good value it provides in economy rather than the other way around. The cabins were modern and very neat, food was amazing and service faultless on all flights. 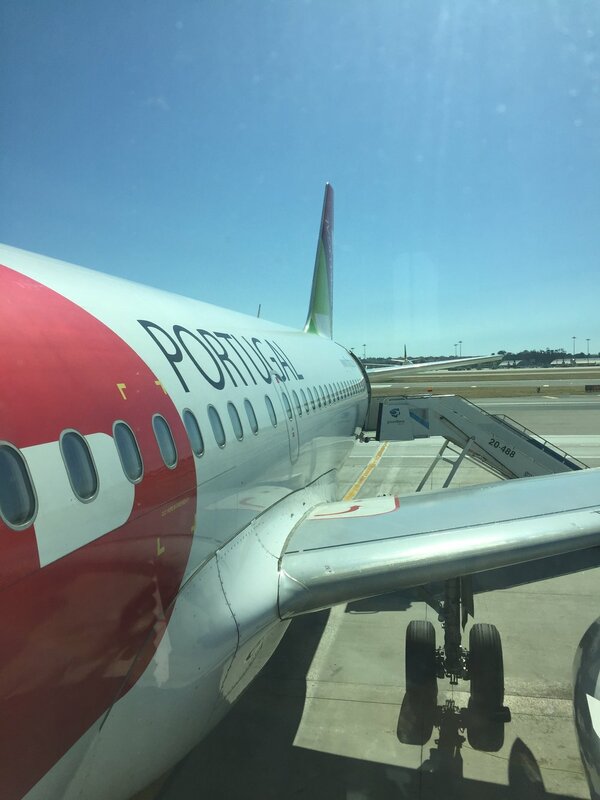 Add to this TAP's newly refurbished lounge and the fact that Lisbon is a modern, convenient and comfortable connection airport (with a superb capital city with plenty to keep you going just a short metro ride away) and the mix gets even more interesting.